That was the sentiment echoed by Corbin Martin and Brett Adcock after the two combined on a one-hitter, totaling 14 strikeouts, as Class A Advanced Buies Creek blanked Frederick, 4-0, on Friday night at Jim Perry Stadium. "I've been putting in a lot of work and trying to improve on something every week and just trust my stuff," Martin said. "When I go out there I can't be scared. I have to be confident that I'm better than every hitter." Martin (2-0), the Astros' No. 10 prospect, started and set down the first seven hitters before giving up a single to Jake Ring in the third inning. Ring was erased on a double play and Martin allowed just one other baserunner, issuing a leadoff walk to Orioles No. 30 prospect Randolph Gassaway in the fifth -- his final frame. He fanned five. The right-hander has not surrendered an earned run over 19 innings in four games this season. "From the start, I could see that their hitters were being very aggressive, so it allowed me to throw off-speed pitches early in the count and get weak contact," said Martin, who leads the Carolina League with a 0.58 WHIP and .065 average against. "And that was the goal tonight, to get weak contact and trust the guys behind me to make plays, and they did." The Astros offense backed Martin with two runs in the first. Josh Rojas doubled in Luis Payano with a fly ball to right field and came in to score on a single to left by Chas McCormick. 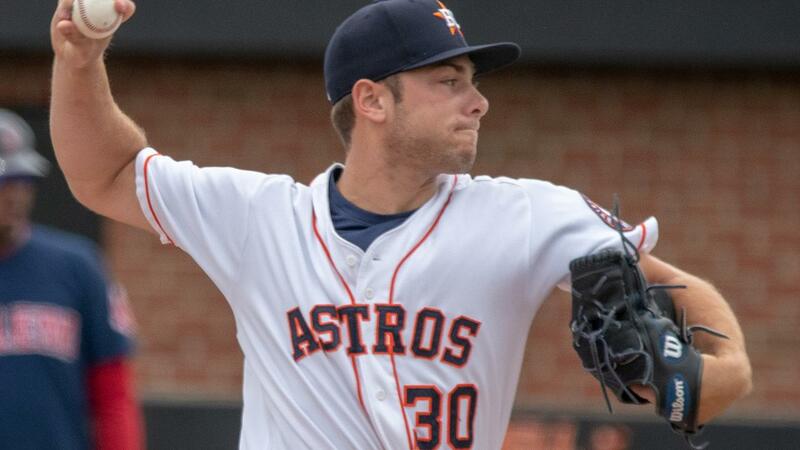 "Being the home team tonight, it all starts on the mound," the Texas A&M product said. "You want to have a quick first inning to set the tone, and when your hitters give you a lead you have to take advantage of that." Taking over in the sixth, Adcock picked up his first save of the season after striking out nine and walking one over the final four frames. After an error by first baseman Rojas to start the sixth, Houston's No. 22 prospect retired 12 of the last 13 batters. "Corbin really set the table for me tonight," said the southpaw, who gave up six hits and three earned runs across 12 1/3 innings over three games entering Friday's action. "He was going right at guys and missing bats and not making mistakes. For me, you get to see where they're missing and it gives you an advantage to know where to attack. He did a great job of exposing the weaknesses of their hitters tonight, and I was able to capitalize on it. "I struggled a little bit out of the gate this season, but I'm finally getting my sense of confidence. My plan tonight was just to attack the zone and trust all my pitches." Martin took notice of his teammate's dominance. "It was almost not fair the way Brett was throwing tonight," the 22-year-old native of Houston said. "That's the best I've ever seen him." Rojas and McCormick delivered again with RBI hits to account for all of Buies Creek's scoring. Frederick starter Brian Gonzalez (0-2) took the loss after surrendering three runs, two earned, on six hits and two walks with a strikeout over six innings.